I wanted the M.A.R.K.1 avatar to really feel like you're in control of a machine, so it has been lovingly scripted to add as much realism as possible, using many sound effects, particle effects and no less than 64 custom made animations to ensure smooth and realistic motion. Main features are listed below, please be sure to also check the known issues at the bottom of the page regarding llCastRay. The M.A.R.K.1 is armed so please be responsible, respect other SL users and do not violate SL Terms of Service. Please contact me with any questions or problems! * Attachments will align themselves correctly when worn to prevent accidental breakage. Manual changes to position and rotation will not be retained. 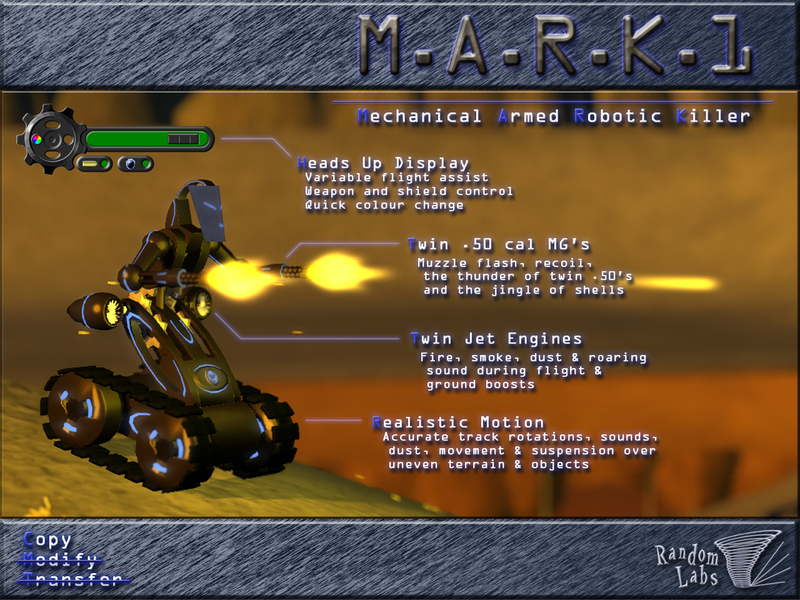 * The M.A.R.K.1 avatar uses mesh parts, you will require a mesh capable viewer to see it correctly. * The M.A.R.K.1 avatar controls it's own animations. Your usual AO will interfere with proper operation so you will want to remove or disable it. * Weapons and shields will only work properly in script and build enabled areas. The HUD controls a variable speed flight assist, arms and dis-arms your weapons and activates a plasma shield. You can also click the colour icon to open a colour change window and a dialog menu listing the parts you can change. NOTE: The HUD is optional, weapons can be armed by clicking on the guns, but the HUD is required for colour change and shield use. Accurate track rotations, sounds, dust, movement & suspension over uneven terrain & objects. Your avatars will angle to the surface it's moving over and the tracks will raise and lower as needed. Tracks animate correctly for your direction of travel, with left and right track sounds and dust effects only running when the tracks are. Strafing rotates the robots upper body to keep your guns always pointing in the right direction and your guns will even aim up as you travel up hill. The thunder of twin .50’s and the jingle of shells! Multiple flash prims with random light and glow levels when firing for extra realistic muzzle flash. Realistic shell ejections with multiple "jingle" sound effects. Tracer bullets that light up the battle field. Bullets have multiple sounds and particle effects, sparking against objects, kicking dust from the ground and splattering blood onto the floor from more fleshy targets. When firing from mouse look the guns track your firing angle, aiming up and down as you do. Realistic flickering flames kick the dust up from the ground as your twin jets roar into life. Ground dust radius increases the lower you get and the jets rotate realistically during flight. Holding forward and back together for a moment when walking triggers a ground boost, jetting you forwards at high speed. The plasma shield is capable of defending against basic projectile weapons but is mostly just for show. It will follow your avatar around turning on and off when needed during flight and movement. Any future updates to this avatar will be delivered free of charge. The M.A.R.K.1 checks for new versions when you wear it, or log in wearing it. llCastRay is used to determine the correct angle for your avatar when moving over uneven surfaces and there are currently a few bugs with this function. Some regions you may find your avatar stops lining up properly and just appears to move at a flat angle, this can sometimes be remedied by restarting the region, but could also be due to the region being overloaded. Either way, your avatar will automatically know when it's not working and will simply stop surface tracking until it appears to be working again. In my tests, some homestead regions would not allow the use of llCastRay at all! Also note that llCastRay can be used a limited amount per avatar when used in attachments and so could be affected by other scripted attachments that also use this function.